Several of the marinas provide grills so we decided to try the cherry barbecue sauce that Kay purchased to cook some BBQ chicken. Why make a mess in our grill when you can use a better grill to burn off the sauce mess? While the chicken was grilling, we snacked on the "Original Cherry Salsa" that I purchased. Cherry Republic (store) has some really good stuff! The BBQ sauce and salsa was yummy! Teak has made herself at home! She;s not spoiled is she? The VFW was advertising $5.00 cheese burgers and chips Friday evening. We decided to head on over! The burgers were good. We were up at 5:00 am to head out by 6:00 am. The weather in the morning was to be good but the afternoon was questionable. We missed the storm. It went by in front of us and all we got was a mist. 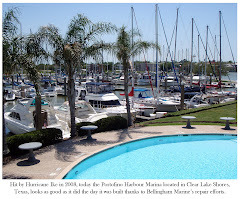 When we arrived at the marina the harbor master told us about another Defever Pilothouse that was coming in later in the day. After we got settled in, Josh and I went over to meet them and pick their brains a little. Very nice couple! They provided us with some good information. Boaters are so friendly and helpful! Another beautiful day on the water! We knew that we were going to get some windy days coming and bouncing around in a slip is not fun so we decided to move on. Most of the towns are small and you can walk them within a few hours. Fishing boat with downriggers out. You would never believe this but we passed "seven swans a swimming" out in the middle of the water. Not sure what it is with being out on the water but we were so tired that we didn't even leave the boat to tour around. We wanted to make time so we knew that we would be up early for another hop down the lake. Today the weather window was calm in the morning and choppy/windy in the afternoon so our plan was to do a short day to Benton Harbor until we get another weather window. Our plan changed when the weather started looking better so we decided to take advantage of it and go farther after we confirmed that we could get a slip. We have seen more mylar balloons on the water than boats the past couple of days. People do not understand that these balloons just don't disappear, they go somewhere. They are floating all over! 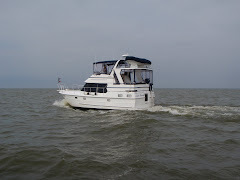 We have a friend who has one of these boats (Pilgrim 40) back in Clear Lake. John Allison's M/V Traveling Star is painted red and black. Holding out for a weather window! One more day and we will be off of Lake Michigan. We have had some very nice weather windows with calm seas and low winds. Everyone told us that this time of year is windy and the weather can change really fast. Because of this we decided to move whenever we saw a nice weather window. 1934 Coast Guard close-shore rescue boat. The bow cabin is where the rescued people were put. The owner found it and rebuilt it. It took him seven years to refurbish it. He takes it around to different Coast Guard stations for tours by the trainees. All the marinas have security keys or fobs for restroom entry. Josh is pretending to use his fob on the port-o-potty. Good choice not to head out today. I do not do rough seas! Kayak'ers at the mouth of the jetty trying to get out. They were going up the wave and disappearing down the back side. At least they had life jackets on! The authorities were announcing on the loud speaker for people to not go into the water because of rip tides. Today was a red flag beach day. This is when we stay at the dock, not my kind of boating! Not sure what this really is. Kay thought it was a hippopotamus, I thought is was an alligator and Josh said it was a crocopotamus, LOL! The "tree" is back down again until we get to Peoria! Tomorrow is our last day on Lake Michigan. Inland waterway here we come!